The Kamry K100 mod is a solid, Chinese made mechanical – a clone of the ultra-cool Empire PV Mod. 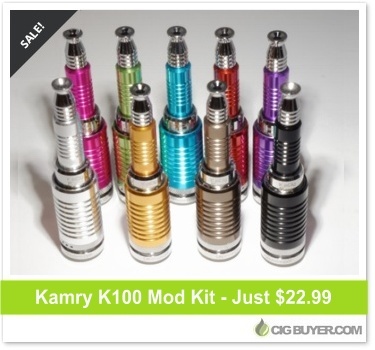 Even at full price the Kamry K100 costs almost 1/3 less than the original; and aside from a few minor differences (including the addition of a universally accepted 510 connector), it’s nearly an exact replica of the Empire PV mod. It comes in several anodized colors and includes a matching sleeve that will fit most standard cartomizers. Without the sleeve any 510/Ego accessory will work, giving you a ton of flexibility. * Coupon expires February, 28 2015. Offer good while supplies last.